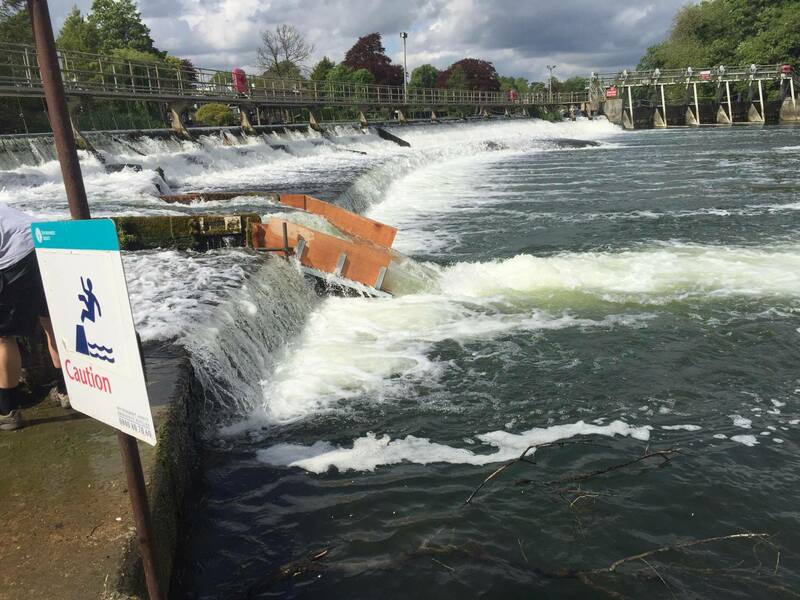 WARNING:In high water people have drowned in the top corner of the weir – just river right of the main gates (or surfers left). The hole will not let you out, so avoid like the plague especially as it can have upto a 10 metre tow back. ( see picture of the corner below). Description: The “Canoe Flume” at the downstream end of the weir produces a good quality pourover style hole during the summer months in which various hole moves are possible. It’s also in very nice parkland, with a petting zoo, cafes and places to have pick-nicks. In very high water a big surfable wave train forms in front of the main gates. When working, the waves have a good bounce for aerial moves but are not over retentive – a challenge very different to Hurley. 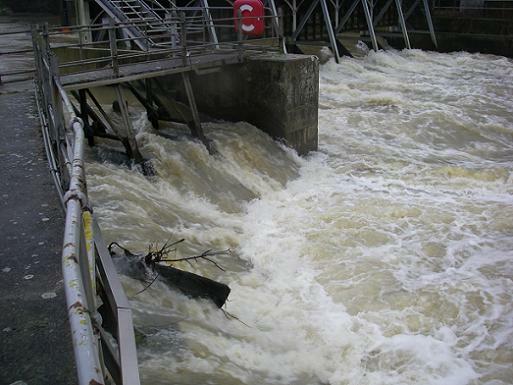 The main problem with the waves, are predicting when the river will be at the right level for them to work. 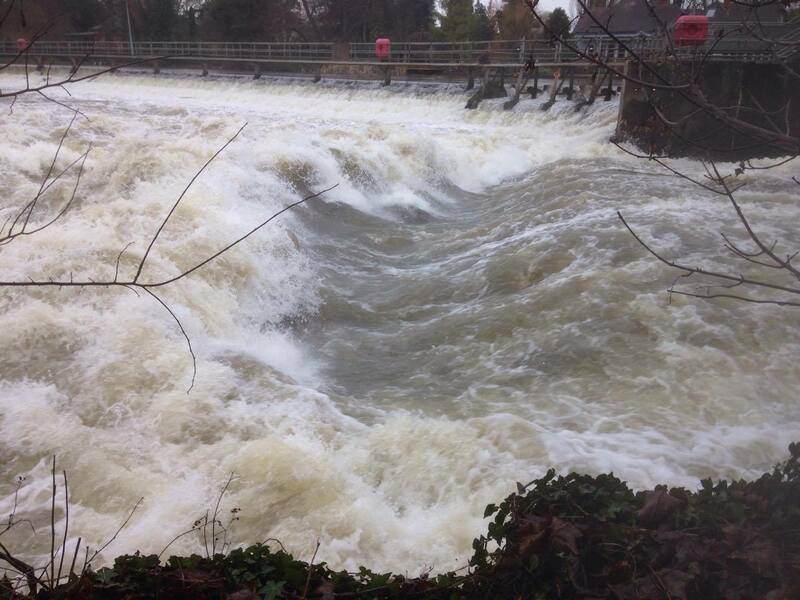 All 6 gates open, river dropping with Jubilee River closing. Created the best wave at Boulters since the sleepers have been fitted to the weir sill. Follow this link to the carpark! From Maidenhead town centre’s ring road, take the A4 to slough. Just before Maidenhead bridge take a left at a roundabout near a Texaco garage – following signs for Cookham. After 500 metres you will pass the lock. 100 metres further turn left into the car park (height restriction 1.9 metres and payment for parking). After getting changed in the car park, walk over the main road, put in on the lock cut and paddle up to the left. When you get to the top of the lock cut turn right. You will soon see the weir spread out before you. First timers should carry on paddling down the backwater and take out onto the island at the convenient egress point and walk over to the downstream end of the weir pool to take a look. Please do not shoot the flume, as you have no right of navigation and you might damage the ramp.